Nearly three years ago we interviewed Cole Dorsey, one of the activist and organizers with the 1990s group known as West Michigan for Animals. This new print, from GVSU student Mackenzie Fox, both celebrates and honors the legacy of Cole and those involved with West Michigan for Animals. Cole was only 13 when he joined the animal rights movement, but his age did not limit his ability to take a stand and use direct action as a means to achieve justice for animals. At some point, Dorsey even out grew the awareness building focus of West Michigan for Animals and began to move in the direction of animal liberation. There was also direct action going on at that time that was not sanctioned by WMFA or undertaken by any “organized” group. I know that roadkill was delivered to the steps of fur stores and that fur coats were damaged on the racks of their stores. I know that “blood” was splashed on their windows and windows were broken. I also know that more than one fur coat got splashed with “blood” while being worn in public in Grand Rapids. I believe all these actions collectively, coupled with society’s changing attitude towards fur, had a major impact on the fur industry in GR. Today I think Leigh’s in East Grand Rapids is the only store selling furs these days. The print from Fox not only captures the spirit of the kind of activism that Dorsey was involved in, it provides a brief narrative about the animal liberation activist. 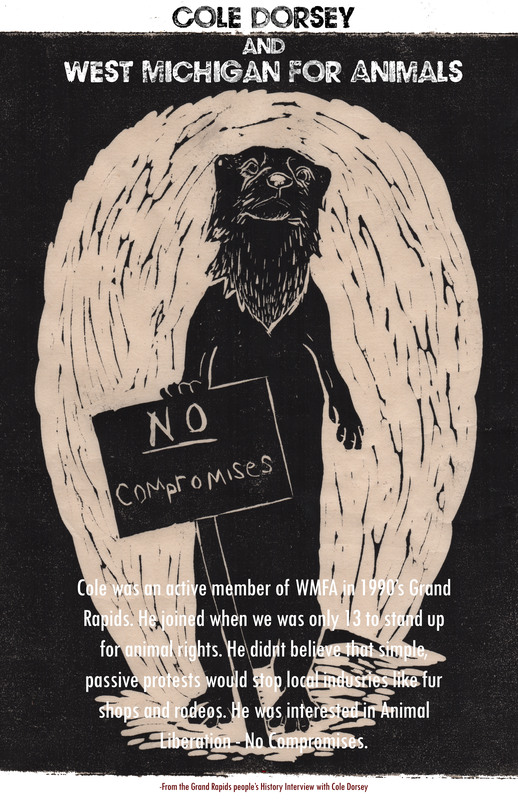 This entry was posted in Animal Rights/Animal Liberation, People's History Artwork and tagged animal rights activism in Grand Rapids, Cole Dorsey, West Michigan for Animals. Bookmark the permalink.